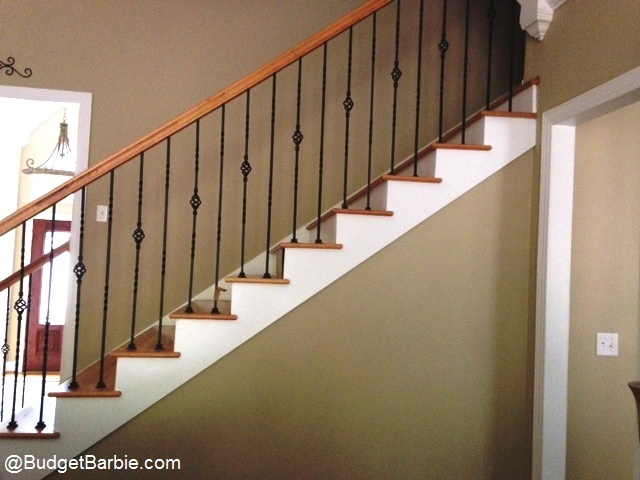 Budget Barbie: Stairs in process - just a quick 'fly by' post! Stairs in process - just a quick 'fly by' post! If you saw the previous post - we were finally going to do 'something' about the wood decorative scrolls installed on the sides of our staircase. Not our style. Not our personality. But... they came with the house. 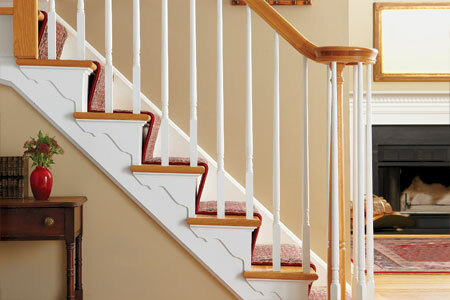 We hated them but wanted a quick, easy and cheap fix-it. The first plan was of course to simply "paint over them". I hemmed and hawed about this for a bit - and put it to question among a couple friends. Deep down inside I knew I wouldn't like it... but it really would be so much easier and I was looking for the easy way out. One of my friends nailed it though - telling me you would still be able to see something was there and it wouldn't hide it well. Sigh... yes, he was right. And I knew it. I just needed to hear it. And then I went online and found a picture of someone who did just that (below). And I knew I wouldn't be happy with it. Again... just not my personality. Even unpainted it still looked better immediately. 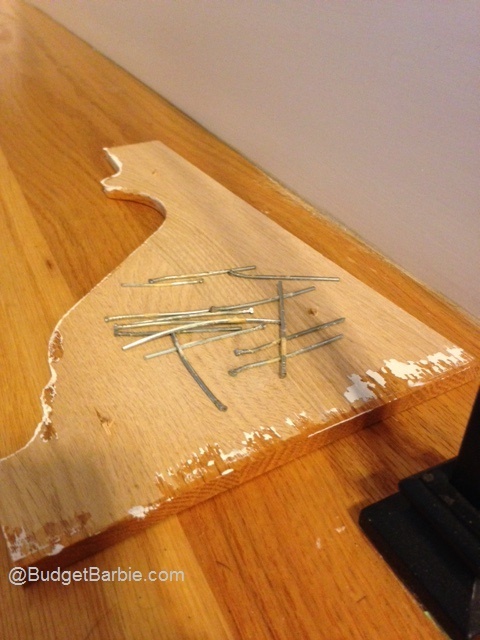 After the wood scrolls were removed, I then had to remove a kazillion nails. I used an orbital sander to gently sand down the area, and then decided I had better fill in some of those nail holes - I wanted to be lazy and ignore them but I knew I'd regret it. I also noted they did some sorry-construction and many of the stairs were cut sloppily (since they obviously intended on installing the scroll work, it wouldn't matter as it would be covered) so I had to go in with some white paintable caulk and fill in some gaps. But realized the paint didn't have the same sheen as the door trim and baseboards so it looked a little 'flat' next to them (even though it wasn't a flat paint). So I grabbed a can of the gloss paint and went over it once for a 3rd coat and called it 'good'. I will be adding a 3rd installment to this post because they are still not done - and I want to apologize because I really planned on doing a nicer write-up but time is getting away from me and it's crazy busy right now in our household. So this will have to suffice and photos of the paint process will be coming soon! Thanks for popping in... see you again soon!